Didn't her Mom and Dad realize that their 'gift' is a herding dog? Didn't they take the time to understand that this breed is extremely intelligent and they are known to GENTLY HERD their owners, especially the CHILDREN of the family! Nipping at feet is NOT biting, there is a huge difference, but the people she depended on most in this world let her down - could it be because they are having another baby and just couldn't be bothered anymore? 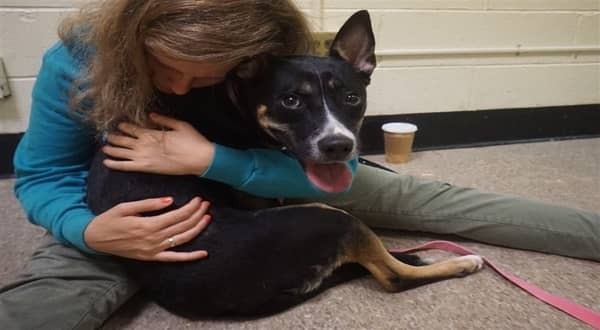 2 Responses to "Terrified pup clings to her favorite volunteer as she got the news formally placed on death row"
There meeds to be some kind of control so that idiots can't adopt animals. Way to go chumps, you sentence an innocent dog to death. I hope you POS are reading this, you are SCUM, you disgust me.